Recently shown at the Patchwork and Quilt Show in Mexico City, uses InvisaFil™ in the bobbin, InvisaFil™ for the raw edge applique and to stitch down the couching. Susan Slesinger has been embroidering, sewing and knitting since she was about three. She is completing her City and Guilds level-3 Certificate in patchwork and quilting with Linda and Laura Kemshall of Design Matters. Her passions include art quilting, wearable art, and fabric postcard exchanges.Susan enjoys introducing novices to the joy of sewing as well as unleashing her students’ creativity. Her work has been featured in Designs in Machine Embroidery, America from the Heart, Creative Quilting, and The Secrets of Digital Quilting. Her quilts and garments have been displayed nationally and internationally at the Festival of Quilts (Birmingham England), the International Quilt Festivals (Houston, Chicago and Long Beach), Pacific International Quilt Festival, and Road to California.When she is not teaching or sewing, she rides a tandem bicycle with her husband, listens to and composes music, and is a volunteer ski instructor for people with disabilities. Susan loves unleashing her students’ creativity and is a member of C & T Publishing’s Creative Troupe. She enjoys introducing novices to the joy of sewing, and teaching experienced sewers all about the fabulous features on the top-of-the-line Berninas. Q: You have been sewing since an early age. How did you learn to sew? A: My mother taught me hand sewing, and my great aunt was a wonderful dressmaker, so she taught me the machine sewing. Growing up in London, UK, the girls were taught to cross stitch when the boys went out to play cricket! I moved to the US in 1974 to get my MBA in international business (I also have 3 degrees in music). For much of my career, I worked in the hospital/government sector in Pasadena, and for an international health care company. I started to teach sewing towards the end of getting my music doctorate. Q: You are skilled in all types of creative work. What is your favorite? A: My favorite things to make are small art quits and fabric postcards. Q: Is there a skill or technique you teach that you love to teach? A: I like to teach beginner classes and get people well started on the basics. I also enjoy teaching machine quilting, and I love to teach customers how to use the new high end Berninas. Q: Do you have a favorite WonderFil Thread? A: I love InvisaFil™. I use it in my bobbin when I am making art quilts, and for applique and as a top thread when I am couching, so the couched thread looks like it is floating on the fabric. I like the way it disappears , and I feel it behaves so much better than a monofilament. I also like to use the 12 wt Fruitti™ for finishing the edges of my postcards. When I use a close set satin stitch with the heavier thread, it does such a nice job of the edge finish. Q: What do you have coming up in terms of shows or classes? A: I have 3 quilts in a show in Mexico City. I also teach 3-4 days a week, mostly in local shops. The rest of the time, I keep busy creating! Uses InvisaFil™ for the bobbin and couching and Mirage™ (rayon) for the blue quilting. Uses InvisaFil™, Splendor™ (rayon) and Spagetti™ (12 wt cotton thread). Donna is a special community minded individual, who relentlessly volunteers her talents and positive energy to make her community a better place. Her many attributes include: incredible sense of humor, persistence in completing a truly unique and stunning design, free motion quilting speed, abilities to create a masterpiece from any assorted fabrics, and sharing knowledge about fabrics & threads. Donna believes that your best work comes from errors, and fixing them. Ignore the quilt police. Quilt police are merely people who do not think and act outside the box. Donna’s inspiration comes from working out problems in her head - whether it is just an idea or work related and/or grief and loss. The quilt becomes a sort of sideline and just happens in the process. When designing quilt pieces, her major assistant was a German Shepherd/Malmute dog - Jessie. She was a true born designer. Donna’s design wall was downstairs - a place she rarely frequented. However, if there was something wrong with a quilt design, Jessie walked by the design wall, several times, wagging her tail fiercely and knocking the pieces on the floor. Needless to say, many were redesigned - and much improved. This dog has been truly missed. Her replacement, Pheebee - much smaller - was a professional quilt dog. If she saw a quilt she liked, she claimed it as hers. Donna says her goal is to use up all the fabric she has! Q: You do a lot of thread work, from thread painting to hand stitching. What started your love affair with thread? A: String. When I was a small child, I loved string and would travel with my dad to all his places where the guys saved balls of string for me. My 93 year old father still has one of these balls - he has saved it in his shop. Q: You teach a Thread Boot Camp. Tell me a little about what you do there. A: I teach people how to use all of the threads in their machines. It is a fun filled day and everyone learns to turn the dials and play with needles and tensions and get a basic understanding of thread. We have students come back two or three times (repeat offenders) and finally get the grasp of it all and away they go. Some even grasp it all the first time. The more they play in a group, the more they explore on their own. Q: Are you surprised about how much or how little your students know about thread? A: No I am not surprised. You can walk into just about any store and ask about thread and they know a bunch of talking points... mostly noise... very little useful information about what to do when it breaks, twists, annoys you. If the stores do not know - there is nowhere else to learn. Q: What is your favorite technique to teach? A: I like to teach students that their machines will not blow up if they turn the dials or adjust the tension or break a needle. I teach them to breathe and to think. Q: What are you favorite WonderFil Threads? A: Tutti, Mirage, Hologram, GlaMore, Sue Spargo's threads, InvisaFil AND DECOBOB. DecoBob is my go to work horse. The rest are all my Sunday horses. Q: What is coming up for you this year? A: I have numerous Boot Camps and Quilt Guild Shows coming up, all the way from Cranbrook, BC to Winnipeg, MB. Once the fibre artists learn how to use thread in all sorts of ways, they are hooked. Kerry remembers being fascinated as a child watching her grandmother crochet and embroider. She was 10 years old when the church offered summer classes in embroidery, crochet and knitting. Her love of needle arts has continued to grow. Quilting became her focus about 30 years ago, especially needle-turn appliqué and embellished wool appliqué. She confesses she still gets excited watching a project come to life as she adds embroidery stitches. When teaching, Kerry urges students to choose a fiber and color that will enhance, rather than match, their appliqué. She finds it very rewarding to watch a student’s excitement build as they learn a variety of embroidery stitches and dare to use new colors and fibers. Kerry lives surrounded by mountains near Salt Lake City, Utah with her husband of 49 years and their 2 dogs. Rarely does a day pass by when she doesn't spend time with needle in hand. Q: Have you been hand stitching for a long time? What drew you to this art form? A: I learned to embroider when I was about 12 years old. I used to watch my grandmother stitch, crochet and knit, and I remember being fascinated. I started to take sewing lessons when I was 12, so I have been basically been sewing my whole life. I love to create, and that feeling of accomplishment I get. I have been focused on wool appliqué for about 10 years now. I just love the way the appliqué pieces change when you add embellishing stitches... it really brings each piece to life. Q: Do you find that classes in hand stitching are growing in popularity? A: I do find that more and more people are drawn to this art form. They are drawn to the beauty of it, and love how easy it is. I have students tell me " I just can't leave appliqué plain anymore. I have to add stitches!". Q: Do you have one stitch that many get excited about? A: I find that most people are excited to learn the bullion knot and the drizzle stitch. I also like to teach them to combine several stitches to create something new. Q: What is your favorite WonderFil thread? A: My favorite thread is Dazzle. I love the hint of sparkle; it is eye catching without being overwhelming. Q: Tell me about your 2019 events? A: I am mostly teaching locally. I will be releasing a new block of the month pattern. My last Block of the Month was called 'Solstice' ( which used a lot of Dazzle) . My new Block of the Month will be 'Nocturne'. I have a stitch along group on Facebook that has a lot of loyal followers. Shelly has been sewing and crafting all of her life. She freely admits to reading all the machine manuals for pleasure and then loves teaching what she has learned to her classes. She makes learning fun, not hard and leaves everyone excited about their new tools and skills. Shelly is a Bernina Educator. Through her company, Sew Shelly Quilts, LLC, Shelly creates and presents original patterns and classes to bring the extended capabilities of all of the BERNINA products to life. Her classes are rich with techniques and software is her passion. In addition, she is a 5 year member of the BERNINA Event Team which has brought the Sewapalooza to you. A: Both my mother and my grandmother were skilled seamstresses. I can remember being very small, sitting on my mother's lap, hand stitching clothes for dolls. By the time I was 12, I was sewing everything I wore. Q: You seem to have a real love of the sewing machine. How did that start for you?A: I seem to have a very mechanical mind. It just comes naturally to me. I never watch tv. Instead, I am digitizing, or reading machine manuals, or working on my computer. Machines fascinate me, and I am really fascinated by the way the machines interact with thread and fabric to create something beautiful. Q: How many machines do you own? A: I have 9 Berninas! Every time it seems like time to get rid of one, I just can't let it go; they become like my best friends. I remember something I made with that machine, then I get sentimental and can't part with it! Q: What is the one technique you teach that most often gives your students their "ah ha" moment? A: I think they are always really thrilled when they learn how to do bobbin work! They get real excited when they see the effect that can be achieved when they put the heavier thread in the bobbin and work upside down. They are also always amazed at the effect that can be achieved with couching. A: I especially love embellishing fabric, so I like to do decorative stitching, or couching; any kind of embellishing, really. When I am not playing with digitizing, that is what I like to do. A: First, it is Razzle (8 wt rayon)! Because I love to teach couching and bobbin work, Razzle™ is just the best for that, and it gives such stunning results. But my second new favorite is InvisaFil™. I have just recently started using it for stitch in the ditch, and you simply cannot see it in that ditch! So even when your stitching goes off a bit, the end result looks great. Q: What is coming up for you next? A: Well, I seem to be on the road constantly. I am doing the Bernina Academies (we are now using WonderFil's reflective thread, Flash, which incidentally sews like a dream!). Then I also travel to dealers teaching the O Sew Shelly techniques classes . YouTube is another favorite way of Shelly’s to engage stitch enthusiasts world wide. She has many up close videos on techniques that can be used with various materials and machine feet. Peggy Kwan was a registered nurse with a very busy Toronto hospital Emergency/Trauma Centre for over 26 years before her retirement. The craft of quilting was her form of relaxation after a hard days work. Peggy has been a speaker and instructor at shows, quilt shop and quilting guilds across Ontario for many years. She has won numerous awards and her work has been exhibited in many places, including a commission piece displayed at St. Joseph’s Long Term Care & Rehabilitation Centre. She is a members of Markham Guild of Village Crafts and Markham Town Quilters Guild. Q: You had a career as an RN. How did you end up as a quilt instructor? A: I worked in the first major trauma center in Canada, Sunnybrook in Toronto. As you can imagine, your adrenaline is high every day, and there is a high burnout rate at this type of job. I had a friend suggest that I take up quilting as a way to relax. It was a life saver for me. I was at the trauma center for 26 years. I never would have lasted that long without my quilting! When I retired, I just moved on to teach my form of quilting. Q: You do a lot of thread painting and hand work. Do you have a favorite technique? A: I am not really someone who likes to do a lot of piecing. I love to do appliqué and handwork. I find that I always feel challenged, which I enjoy. A: I do my construction differently. I compose pieces block by block, with all three layers at a time. I see fibres differently. At first the students didn't know how to take it, but now I have a following of people doing my technique. Because it is different and not for everyone, I always invite a new student to come and take their first class for free. Then if it is not for them, they have no commitment. My classes are growing! A: I use PolyFast a lot, as rayon doesn't work for my 'construction' style of quilting. I love the Sue Spargo Eleganza for my hand work and the color changes in FabuLux are beautiful and work really well for what I do. And of course, I always use DecoBob in the bobbin. Q: What is coming up for you this fall? A: I teach often for the Markham Guild, and at Village Craft every Wednesday. Come and check out one of my classes! 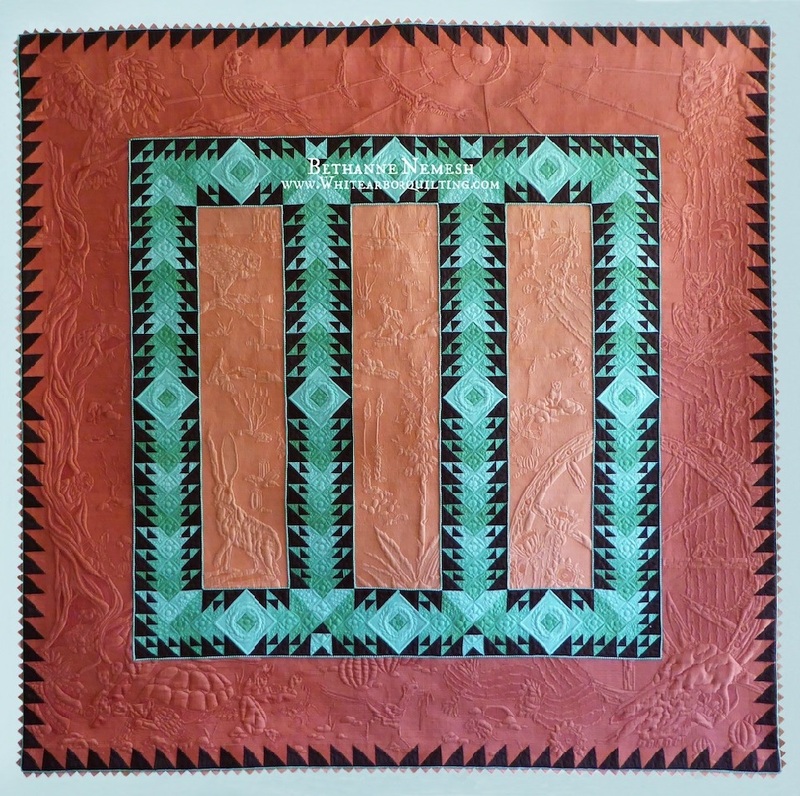 Phyllis is the Hawaii regional rep for SAQA, an international organization (StudioArt Quilters Associates). Bethanne is a classically trained artist, with a Bachelors of Fine Arts and a Masters in Art Therapy. 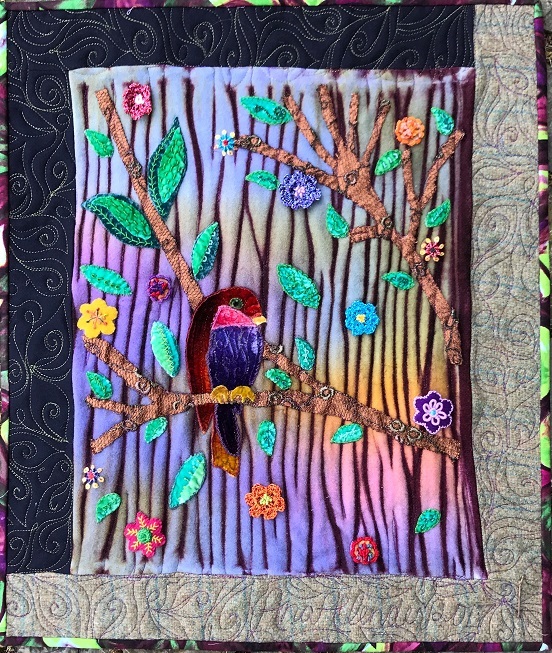 The fiber arts became her art medium of choice in 1997, but her focus changed in 2007 when she purchased a longarm sewing machine. For many years she was a custom longarm quilter for hire, but as her style became distinctive, she began teaching quilting to others and writing books to support her classes. She is passionate about teaching others to follow their own creative journey through quilting, and about expressing herself through show quilts . Q: You have a strong arts background. How do you feel that translates into your quilts? A: In numerous ways. I tend to approach my quilts from an 'art first' standpoint. A lot of quilts go with traditional shapes like feathers, etc. I can appreciate that, but I don't find it is interesting to me. I tend to use my longarm machine like it is a pencil ( although it doesn't erase so well!!). Growing up with an arts background, I got used to attending gallery shows. When you go to art galleries, while you may not love every piece you see, you learn to determine the aspects of the piece you like, and decide what you can pull from the good parts of what you see to influence and improve your own art. I treat quilt shows like they are art galleries, and try to look at every piece in that way. I believe that also helps me to be a more supportive , positive teacher, because I try to always 'critique' students work in a very positive way, by pointing out the aspects of their work that is great, while gently suggesting some areas of improvement. Q: You are a very decorated show quilter. How much time does a typical show quilt take you? A: There are really two answers to that question. My first answer would be '20 years' as every quilt I have made on my journey leads me to the current piece. However, since I believe you mean time for a specific quilt , not counting the designing ( which is hard to pin down, as it is something I think of and plan out over time), a show quilt can take me a year, or around 500 hours. But that can change a lot according to the finish I choose. I am currently working on a piece that is taking me 20 hours per side for the finish I am giving it. So the finish can easily add another 100 hours. Q: Where do your show quilts end up? Are they hanging in private collections? A: I have a hard time parting with my winning quilts, as I become emotionally attached to them. Some of them hang in my house if it works ( although I never design a quilt based on how it will look in my house), but most of them end up travelling with me to teaching and lecture engagements. They become good examples for me to demonstrate different techniques. Q: What machine do you currently use? A: I am still sewing with the A-1 I purchased in 2007. Nowadays there are so many options for long arm quilters, but when I bought my machine, there were not many choices. That being said, my machine works great for me. Q: What is the best tip you would give to someone who is just looking at purchasing a longarm, or just starting to use one? A: Practice! Although that is not what most people want to hear, there really are no shortcuts. Years ago, no one would even think about purchasing an expensive longarm machine if they didn't plan on making a living with it. When you are on that machine for hours a day, working on clients' quilts, you really get a lot of time to improve your craft. I also believe if you are very experienced at quilting on a domestic machine, you will have an easier time of it. The difference is, with a longarm you are moving the ' pencil' and with a domestic machine, you are moving the 'paper'. A: The most gratifying thing for me is the when students tell me that I presented things in such a way that they feel they finally 'get it'. Also, custom quilting and working out of your home can be very isolating, so teaching really gives me that sense of community. Q: What is you favorite WonderFil Thread? A: Invisafil! I work a lot with silk fabrics, and InvisaFil has just the right amount of soft sheen to work well with them. Real silk thread is far too pricey and fragile. InvisaFil has the right strength. I am also a new convert to the DecoBob bobbins. They are evenly wound, so the way the bobbin acts when it is full is the same as when it is nearly out. I find that WonderFil's plastic bobbins are also much better in my machine than the cardboard kind I used to use. Q: What is coming up for you in 2018? A: I will be heading up to Canada in March to present for a guild in the Toronto area, then I will be teaching at Manchester MQX, and in June, an I am presenting at Steamboat in Colorado, and plan to combine it with a family vacation! I will also be at AQS Grand Rapids, and several other shows. And I have two show quilts making the rounds now ( 'Westward Sun' and 'Song of Summer'), and have submitted one of my quilts for the Houston show as well. Phyllis has shown, sold, and taught all over the world. She makes her home on the beautiful Hamakua coast of Hawaii's Big Island, where she enjoys sharing her studio and her knowledge with others. Q: How did you start down the path of art quilting? A: I have always done art; painting, drawing, embroidery. Really, I have never met a medium that I didn't like! But when I discovered fabric and threads, and learned how much texture and the great sculptural effects that I could achieve, I was hooked. Q: So what is your background? Did your mother sew? A: My mother was an artist, but I learned mostly from taking a few classes and reading a lot of books. Q: So where do you find your inspiration? A: I always think "If I were a writer, would I want to write about this?." I love to tell a story with my choice of color and design. You know the old saying," A picture is worth a thousand words," so I use my quilts to tell the story. I also want to use my works to make people happy, so I like to use a lot of color. In classes, they always say," You need to find your voice" and to that my response is "I believe I am multilingual!" Q: You live in the beautiful state of Hawaii. How is the quilting scene there? A: There are a lot of different kinds of quilts here. While there are traditional quilts, we live in a place that never goes below 60 degrees at night, so there isn't a great need to create warm quilts. About 50% of the population is Asian, so there is a strong Far East influence in a lot of the work.Then we have Hawaiian influences and a lot of art quilting. There are more artists ( of all mediums) per capita in Hawaii than in any other state, so we have a vibrant art scene here and quilting is accepted as part of that scene. A: That depends on the project. I really like my threads to show, so I gravitate towards the heavier threads. That being said, I won't use anything but DecoBob in my bobbin...my longarm just refuses to work without it! I use a lot of variegated threads, like Mirage, because I love the color changes, and your cotton ( Konfetti) is great for piecing. You have such a large offering; I am looking forward to trying all of them! A: I teach locally a lot and we have 3 local shows this year ( Quilting on the Beach). I have applied to teach at the AQS shows, and I have been invited to teach at the Israeli Quilting Conference in July, as well as in Mongolia and Australia. I am working hard to have some new pieces completed for the upcoming SAQA exhibits. So I am pretty busy. That being said, I love to teach, so let people know to contact me if they would like me to come to their guild or show. Vikki has been part of our Teacher Program since 2008. Vikki is a full-time professional national/international teacher, lecturer, quilt-artist, designer and author. Vikki and her quilts have been featured in many books, national publications and exhibitions. She has won 32 awards in national and international competitions and exhibitions. A self-taught artist with experience in painting (watercolor and oils) and sculpture, Vikki is known for her flowing designs and passion for color--as well as breaking all quilting "rules." She is the author of three books "Quilting Curves” , “Quilting By Improvisation” and "Nurture Your Creative Spirit: Wisdom and Insight Learned From the Art of Quilting", and has produced a DVD, “Crazy About Curves". Vikki has written many “how-to” articles published in Quilter’s Newsletter, AQS and Quilting Arts magazines. Vikki is also the founder (1999) of the national biennial Sacred Threads Quilt Exhibitions, a two-week display of original artwork that explores themes of spirituality, joy, inspiration, healing and grief. Deeply influenced by her husband’s bout with cancer and his recovery in 1993, most of Vikki’s artwork now focuses on the themes of healing, spirituality, hope, and inspiration. Vikki lives in Reynoldsburg, Ohio. Q: How long have you been quilting? How did you start?
" Healing Quilts" when my husband was ill. I made a quilt I called 'Breaking Point', with a tree clinging to a cliff, because that is what I felt like at the time. Q: You do a lot of appliqué work. Do you prefer hand or machine appliqué? A: I actually do a combination of both. I wanted to do a lot of curves in my quilts, but I found the traditional methods for piecing curves didn't work for me. I developed a method of stitching one piece down without turning it under, then stitching the adjoining piece over top with the allowance turned under. Once I found a good stabilizer, it worked very well for me. I submitted my quilt to 'Quilter's Newsletter' and it was published in 1996. When they asked me to describe my method, I ended up writing a 4 page article about my technique. My whole career has stemmed from that article, as I started to get requests to teach. I love travelling and I love creating, so I feel so lucky to do both. Q: Do you do your own quilting, once the quilt is constructed? A: Yes, I do it all myself. I have purchased a mid arm machine for some of my work, but I find I still do a lot of the quilting on my old domestic machine. When I start the quilting, I often have no real plan before I start...I just start to sew! Q: You seem inspired by nature. How do you find your inspiration? A: I use nature as the metaphor for emotions. 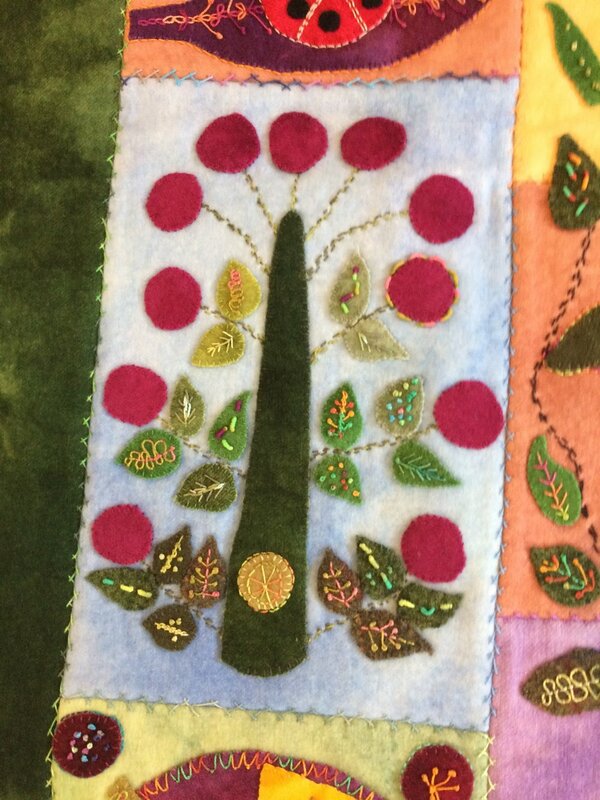 For example, in my quilt 'Life Beyond', I depict a tree in the winter, with its roots in a frozen pond. Winter is really the season after the growing cycle, a sort of 'death' of nature. I remember walking in the park one winter and noticing that I could still see the gold fish swimming under the frozen surface of the water. And that was the metaphor...that even if we couldn`t see it, there was life in that seemingly dead park. A: My clear favorite is your 100 wt thread, InvisaFil ( Vikki designed WonderFil's InvisaFil color sets in 2008). I also love to quilt with your slitted polyester, Hologram. I like to use two strands through one needle to make the quilting work 'pop'. Some of my quilts have open spaces that I fill with 'webs' of thread, that I create using a wash away stabilizer and Hologram and InvisaFil. Catherine joined the WonderFil Teacher Program in 2015. Catherine grew up in the Northwest of England and learned to knit and sew at an early age. While she was in university studying for a degree in Food Science, she took up knitting and cross stitching. She also met her husband there, and together they raised four children. In 1995, they moved to Naperville,Illinois, just after she had published her first cross stitching pattern.She took her first quilting class at Stitches and Stuffing in Naperville in 1998.Five years later she started teaching quilting at Pieceful Heart Fabrics and taught there for 10 years until they closed their doors in 2013. In 2013, she was invited to appear on Quilting Arts TV and has since taped several segments on various topics. She is a regular contributor to Modern Patchwork magazine and is the author of two Modern Machine Quilting QATV workshop DVDs. Q: Tell me a bit about how you started quilting. A: I have sewn since I was a little girl. I used to teach cross stitching when I still lived in England. When I moved to the United States, many of my new friends were quilters. My daughter had to make a qulit as a project, so we took a trip to a quilt store together, and it all started from that. Q: You do many different quilting styles: free motion, Modern Quilting with the feed dogs up, hand appliqué and embellishing. Do you have a favorite technique? A: I still really enjoy hand stitching. I like to sit and take the time with my work. But I also really like to finish my own quilts. I am a Bernina embassador, so I do all my quilting on a Bernina domestic machine. When I taught at the quilt shop, the owner would see something new and ask me to teach a class, so I took a lot of classes myself and was able to learn a lot of new techniques. Q: You are new to the WonderFil Teacher Program. How did you hear about us? ( InvisaFil) worked for piecing. I was doing English Paper Piecing at the time. I decided to give it a try although I was sure that it would be too fine. I was wrong; it was really easy to use and did not slip or break. Q: What are your favorite WonderFil threads? A: As I said, I love the InvisaFil for my appliqué work and for English Paper Piecing. For the hand work, I love Eleganza. I am so impressed with the quality. The thread runs so smoothly through the cloth, and I love the many bright, solid colors. A: I am a very curious person and I love to learn. But when I learn something, I want to tell people about it. I've always enjoyed passing along what I've learned. I love to be able to explain things to people in a way that they will understand. I want my students to be inspired to go home and create. Q: What is coming up for you in 2016? A: I will be travelling to new places this year ( Calgary- my first trip to Canada, Tennessee, South Carolina). I will also be teaching at IQF in Houston. Apart from raising my children, this is the hardest I've ever worked. I love it! Hilary has been part of our Teacher Program since 2008. Hilary Rice, an award-winning Textile & Mixed Media artist, has an experimental approach to her use of a multiplicity of techniques and unusual materials. Her classical music training at Queen’s University is evident in her colour-filled, skilfully embellished, flowing textile-based works. The diverse results, while strongly connected in design and style, offer a wide audience appeal. 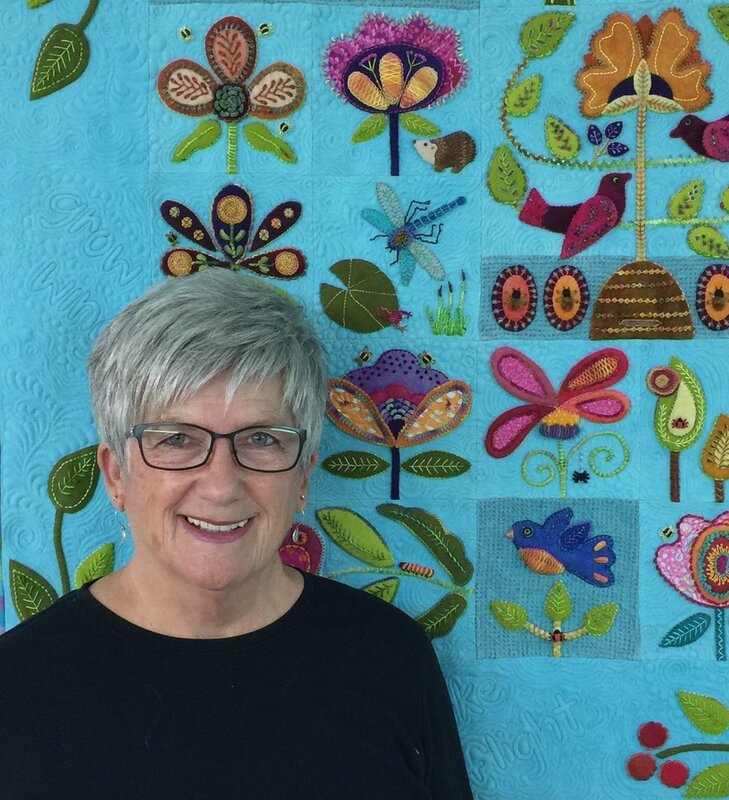 In recent years, Hilary has developed a strong presence in the quilt art world across Canada, marketing her line of art quilt patterns under the “Mother Earth” label and teaching art and design based workshops. She has exhibited widely, with work in national and international shows. 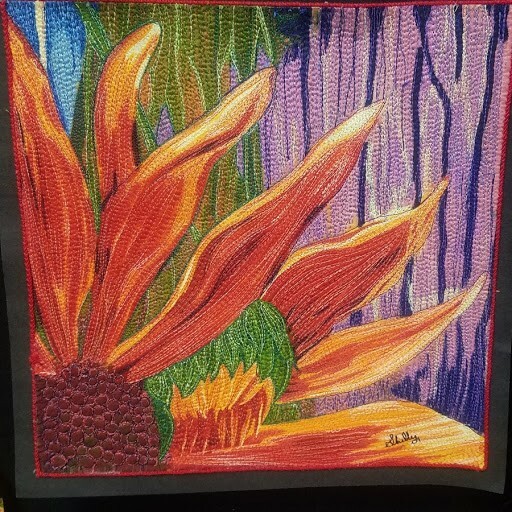 Hilary is a fully certified judge with the Canadian Quilter’s Association, and is a proud member of the “Connections Fibre Artists”. Q: You create many different art forms. What is it about quilting that appeals to you? A: I have moved through a number of different stages with my textile art, with each stage focusing on a new ‘love’. I began with curved piecing, pushing myself as far as I could. Soon, along the way with this, surface design snuck into ‘the picture’ (pun intended! 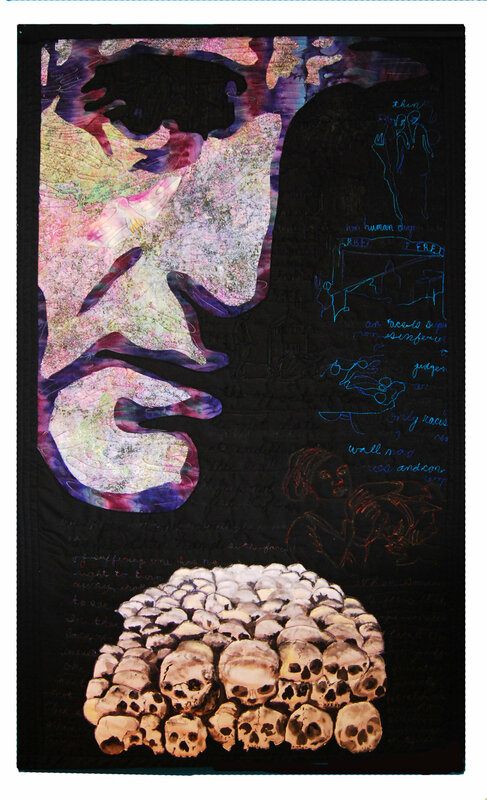 ), and I discovered the work of Libby Lehman, and how she used thread to create dynamic quilts. I began to use her ‘threadplay’ technique occasionally. And now, at this point in my career, I am enjoying focusing even more on highlighting the threadwork, becoming more and more detailed and expressive using thread. Using intense stitching together with a layered ‘quilt’ produces wonderful trapunto shapes. This is where I am now – exploring the results from this. So, to answer your question directly, I believe it is the challenge that each new ‘love’ presents – the challenge to create something meaningful and expressive, and developing my skills to their limit in order to create a physical representation of what is in my heart. Q: Where do you find inspiration for your quilts? Do you know when you start one what mediums you will include, or do you add to it as you go? A: Inspiration seems to come from somewhere deep within, melded with an experience of nature and my sense of the holy. I will often find a phrase I read that speaks to me, and I’ll jot it down. Later, I’ll return to these notes, and what speaks to me then, grows in my imagination. I mull it all over… thinking of what elements need to be used to produce the feeling that I am experiencing. This often begins with colour. Then I start to make choices, continually narrowing. The mediums come with this process, as I choose certain aspects that are best illustrated with one of my usual techniques (although unusual for most quilters). I do often begin with a small thumbnail sketch, but I’m completely open to adjusting that as the work develops. Q: How many times a month do you teach? What is your favorite part about teaching? A: I really love passing on my excitement of the creative possibilities available. My favourite classes are ones that introduce these possibilities, knowing that if the student is truly interested in developing their artwork, they will take in the information and work at making it their own. I try to limit my teaching to once a month: the rest of my time I try to focus on creating. A: My favourite WonderFil thread is InvisaFil. It really works for me, because of the intense stitching that builds up… InvisaFil is super fine, and helps to not cause any stitching issues. I have also really enjoyed using Silco and Konfetti in my intense surface painting, as a contrast against the shine of rayon or polyester threads. Debby Brown has been a Handi Quilter educator since 2005 and has inspired quilters all around the globe. In addition to teaching at retail shop events and guilds, Debby teaches at major quilt shows nationally and internationally, including International Quilt Festival (Houston), Australasian Quilt Convention (AQC), International Quilt Show Dubai, and American Quilters Society (Lancaster, Phoenix). She recently filmed a series of DVDs about sit-down machine quilting featuring the HQ Sweet Sixteen®. Debby also teaches machine quilting classes at Craftsy.com. Since Debby began quilting in 1986, she has completed several thousand quilts for herself and others. When not busy teaching, she is constantly creating in her studio in upstate New York. She and her husband were just promoted to “grandma and grandpa” and are very enthusiastic about their new roles! Q: How did you start quilting? A: I started 30 years ago, when I was pregnant with my first child. I first learned from a book from the library, but I really knew nothing about cutting and piecing.I soon discovered that I really loved the quilting aspect the best, so that has been my focus. Q: How many quilts do you estimate you have done since then? A: Oh, thousands. I was doing custom quilting for people. It is how I put my children through college. Q: What machine did you start with, and what are you working with now? A: I started out with a Gammill Optimum. I now work with a HandiQuilter Fusion and a Sweet Sixteen. Q: You do a lot of traveling, teaching. What is your favorite part about teaching? A: Free motion can be scary for people. But I love seeing that look in the students eyes when they realize " I can do this!". A: Well, my new favorite is the new Fabulux ( Debby has designed Fabulux color sets for WonderFil ). I also love Konfetti and Tutti, when I want to work with cottons, and InvisaFil and Decobob when I'm going for texture. I love that I can throw in a DecoBob bobbin, and just stitch and stitch without having to stop to wind a new bobbin. And I love InvisaFil for hand appliqué; it is a good travelling project. WonderFil carries 25 lines of thread ranging from 100wt to 3wt in different materials. Have you ever had hard time deciding which thread to use for your projects out of all those thread lines? This Thread Uses chart will help you to decide which thread will best suit your projects! 'Oh Canada' Quilt Pattern by Calgary's Cheryl Arkison. This month is Quilt Canada month, and we are also celebrating Canada's 150 birthday! WonderFil™ is proud to have been a Canadian company for 29 years, and would like to thank our teachers from all around the world for supporting us and introducing your students to our threads. We couldn't have done it without you! Our Feature Teacher this month is teaching at Quilt Canada and has been in the WonderFil™ Teacher program since 2010. Meet B.C. 's Julie Plotniko. The piece is stitched on linen (front and back) with one layer of bonded cotton batting topped with two layers of wool (Hobbs Tuscany) batting. All of the background stitching is done with InvisaFil in several shades of gold. I just love how this thread adds subtle shading while it lets the quilting be the star! The outline of the Phoenix is done in a variety of threads, mostly PolyFast. Colour was added to the piece (watercolor pencils set with textile medium) after the completion of the quilting. Julie says,"I have always been drawn to the beauty and tactile nature of cloth and do not remember a time when I did not sew". Her love affair with quilting began in the 70's and she has been teaching all things quilting for over 30 years. machine embroidery and sewing machine (software) techniques. She also works in the sewing machine industry, so she is comfortable with all machines and teaches on both standard and mid arm machines. "It is my belief that to see a student go from tentative beginnings to confidence in themselves and their abilities is one of the greatest rewards life has to offer". Q: You have a wide variety of specialties and classes that you teach. Do you have a favorite technique? A: I guess I would have to say my favorites are free motion and thread painting. I love my thread! Q: You have been teaching quilting for 30 years...what changes have you seen in that time? A: There is a lot more diversity in quilts now than there used to be. We have so many products and choices now. The quality of the fabrics, threads and tools has improved so much and we have so many options in terms of color, that it really opens the door to creativity. When I first started, mid-arm and long-arm machines weren't around. When doing free motion work ondomestic machines, we had to run the machine without a foot; specialty free motion feet weren't available. Also, I am seeing different customers getting into quilting now. People in their 20's and 30's have more time and disposable income now and they are excited to learn, but they are not so interested in following any 'rules'. I have also noticed more retirees starting to quilt, so those two customer groups are really going to change the face of quilting. Q: Tell me a bit about your sewing background...how did you learn to sew? A: I grew up in a military family, so we were always moving. When I was small we lived in the UK. My mom used to subscribe to the 'Needleworks and Crafts' magazine, as it was her lifeline to her North American home. I used to grab the magazine as soon as it came and pour over it. In school in the UK, they used to teach us to stitch before we started to write, to improve coordination. I loved that part of the day! My parents always encouraged me to figure things out on my own and be an independent learner, so I learned to hand stitch and use the sewing machine when I was very young. Sewing became my thing! Q: Tell me what teaching experience stands out for you. A: Last year's Quilt Canada show was amazing for me. I absolutely loved the environment and the large classes. It is always interesting to teach groups where there are different abilities, because it forces me to grow, and re think my methods of teaching. You realize that there is no such thing as 'wrong' and you learn to approach things in a new, fresh way. A: I was afraid you were going to ask me that! That's tough, as they are like my children and I love them all the same. Right now, though, I am loving working with FabuLux. It has such a gorgeous shine, and the colors are fantastic. I also really love InvisaFil, as you can do so much stitching without getting a buildup of thread. Q: Besides the Quilt Canada show, what is coming up for you in 2017? A: For the rest of 2017 and 2018 I am looking forward to travelling throughout the country, meeting lots of new friends while teaching for various Quilting guilds, Sewing Shows and conferences. I really love the travelling. We live in such an amazing country, with new beauty around every corner! Everytime I am exposed to something new it changes my perspective. Sewing and quilting has taken me on such an amazing journey that I could never have predicted! Helen met Andrew ( WonderFil's founder) at a show in Melbourne in 2009. 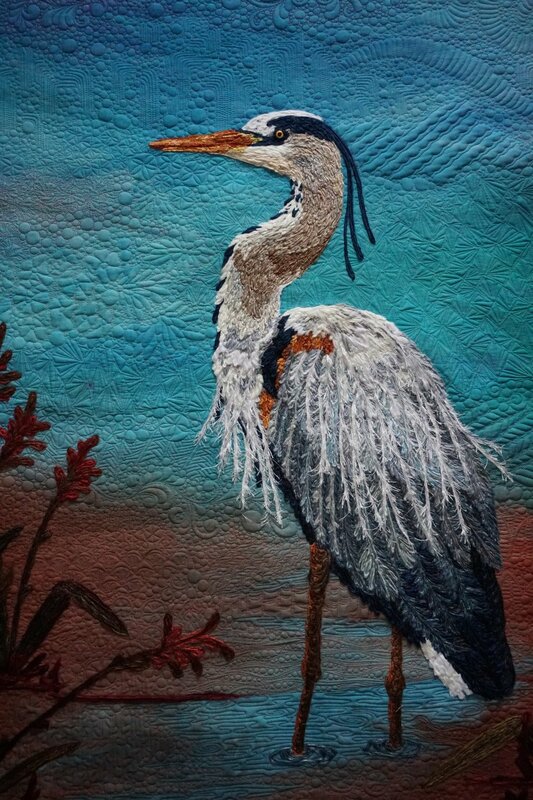 Helen does art quilts that depict the flora and fauna of her native Australia. She started out as a florist, which gives her a real understanding of the colors and dimensions of plant life.She teaches at retreats and workshops all over Australia, and has a large sewing/teaching facility on her property in a rural area one hour south of Perth in Western Australia.Helen got up at 2:00 am her time to let out her dog and grant us this interview! Q: How did you start making art quilts? A: A few years ago my husband had a stroke and I had to quit my job to be his full time care-giver. I was told that it would be important for me to find something to do when I wasn't caring for him, so I took up quilting. I used to paint watercolors in my spare time, so the transition to art quilting was a natural one. ( My husband is recovering nicely). Q: Where do you find the inspiration for your quilts? A: I live in Western Australia. It is a huge state with a low population that is know for its mining and wineries, but it also has incredible scenery and is famous for its wildflower season ( September- October). My father raised us to really appreciate nature and there is a wealth of plant and animal life for me to observe where I live. A: I use DecoBob in my bobbin 100% of the time. It is perfect when you are doing a lot of stitching. And I absolutely love Mirage! It has such brilliant intensity and shine. Because it is random dyed,I just watch what color is coming off the spool and move my work accordingly to accent a different area. I will then use Accent ( 12 weight rayon) in areas I want more emphasis.When I want less shine, I will use Konfetti Tutti, and Fruitti. A. I will be teaching at the Misty Mountain Getaway next week.Then I would love to take 2-3 months just to travel through Western Australia and photograph and paint the area. Susan is a quilt designer/author/teacher/inventor and admirer of all things quilterly! 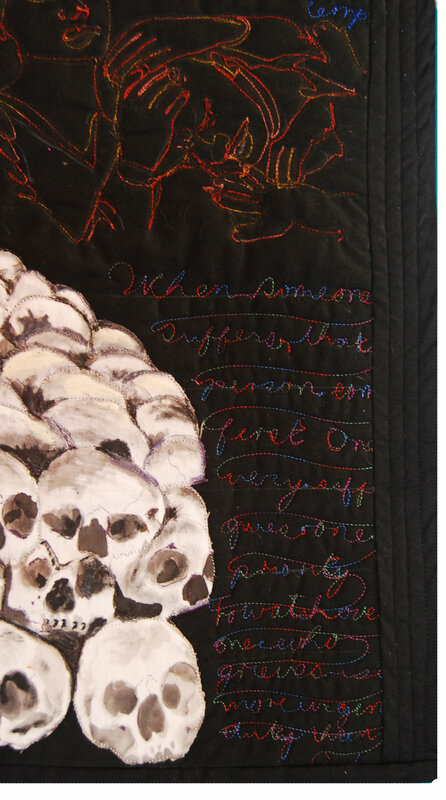 Her quilts are loosely based on traditional designs with a fair bit of unexpected surprises and details. They showcase precision piecing, thread embellishments and bold color. Piping is used in her quilts to accent curves and special binding techniques. She enjoys sharing her quilts and passing along her techniques to others. A: I have been sewing since I was a child, mostly making garments and home decorations. When my kids were small I went into a fabric store and saw a panneled fabric that coordinated with a tablecloth I had, so I decided to make a wall hanging. I remember being upset that the panels didn't allow enough fabric for a 5/8" seam allowance! Q: How many quilts do you estimate you have made? A: My records show that I've made about 170 quilts. I can't believe it myself! I mostly make smaller quilts and wall hangings. I enjoy using a variety of techniques and like to incorporate several techniques in each quilt. Q: You use such vibrant colors in your quilts;where do you find your inspiration ? A: I have no idea! I attend a lot of quilt shows and get a lot of exposure to what others are doing. I like to use a lot of color in each quilt. I will usually lay it all out and see what I like. Then I have to step away for the night and revisit it the next day. Sometimes what I loved yesterday, I don't even like today. A: I like to work with solids and prefer hand dyed fabrics that have very subtle texture. A: Spagetti!! When I first started quilting, I realized that I didn't enjoy free motion quilting. There are so many people that do such a beautiful job of it, but it just wasn't my thing.Then I was lucky enough to attend some classes by Maurine Noble and Libby Lehman.They really influenced me. They taught me how to quilt with the feed dogs up, which led me to enjoy working with heavier threads, and Spagetti is perfect for that. I also love InvisaFil , as I like to stitch in the ditch, and machine appliqué and the InvisaFil disappears beautifully. I love to pass my passion on to my students, and quilters are so appreciative, that teaching is a joy! Our Teacher of the Month: Dominique Ehrmann! Dominique lives in Ste Sophie Québec in a house she and her husband built surrounded by a pine fôrest. "I was a Chocolateand special event cake makerfor more than 25 years, creating customizedcenter pieces. I discovered quilting and wall hangings in 2005; it was a life changing experience. Since then, I have taught myself to quilt, to draw and to create 3D quilts because it is the way I imagine them. I put my chocolate career behindand started teaching in 2007, at Courtepointe Claire in Laval. I am still teaching mostly there but now I travel to teach and give lectures in Québec, Ontario, and US. My quilts are different and when I enter a contest, I never know if I will win a ribbon or be rejected. Since 2008 I have entered contests and won awards every year. I am known to 'rock the boat' in the quilting world because the show organizers do not quite know where to categorize my work." Q: What was your first 3D quilt? A: My first quilt was called Lady Gabie (image above). It was named after, and made for my oldest daughter, who was turning 25 and just graduating from design school. I wanted a gift that would impress her! I was also thinking of the day when she would have children of her own, and wanted them to be able to see the quilt from their level. I first built it in scale out of cardboard, then got to work with my quilt. Q: Where do you find your inspiration for your quilts? A: My projects always start with a story. I tend to think in 'cartoons', and I always need the story first. I believe my work with chocolate may have also affected my approach, as I specialized in 3D centerpieces. My father was an architect and I inherited the desire to 'build' ( I used to take my toys apart to see how they were made). My husband and I built our house when we were 22, just the two of us. It took us three years. A: I work with traditional quilting materials and my 3D quilts are all sewn...I never use glue. I want them to still be soft like a quilt. I do sometimes use foam for structure. A: I always say that if I were on a deserted island, the one thread I would have with me is InvisaFil ( 100 weight polyester). I use it in the top and bobbin for piecing, in the top for quilting, and I can double it or triple it up in the top, with different colors to create different effects. I use it for hand stitching my binding on, and for hand and machine applique. Here is a simple idea to freshen your Easter table. It requires few supplies, and is quick and easy to make. WonderFil threads add the color and fun! Scraps of fabric for rooster and fusible web. WonderFil™ Eleganza #8 in White and Red(#EZ24) for embellishing. InvisaFil (100wt Cottonized Polyester #IF104-White) to stitch hem. 1. Press down ¼” around perimeter of rectangle. 2. Carefully measure a 1” hem around the edge and press again. 4. Mark a line with disappearing marker ¾” from pressed hem edge. 5. Pick a spot (not on the corner) and with a large eye needle, thread the two heavier threads from right side to wrong. Starting with the heavier thread ends pulled to the back will make it easier for you to have a clean finish at the end of your work. 6. On the right side, feed the threads into your cording foot (keepingthe heel of the foot close to where the ends have been pulled to the wrong side)and, following your marked line, begin stitching. You can use a simple zig zag, or pick one of you machine’s decorative stitches. Adjust the width of your stitch so it just clears the top threads on each side. We stitched two threads down at once, but you could opt to stitch two or more single rows. A couching or cording foot like the one pictured is helpful to keep the strands evenly spaced . 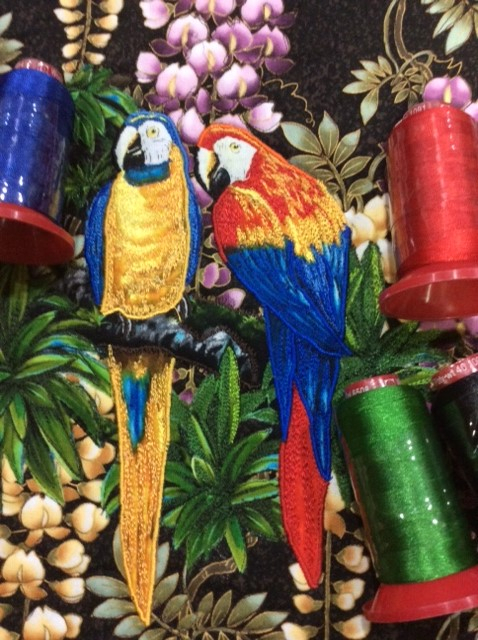 You will be laying the heavier threads on top of your fabric, and stitching them down with the decorative stitch and Tutti threaded through the needle. As we always do, we used a DecoBob prewound bobbin in the bottom (in white). 7. When you get to the corner, stop with your machine needle down and to the inside of your rectangle, to make a square corner. 8. Complete your rectangle, lining up the finished threads with your start. 10. Using your marking pen, mark a spot double your hem width from the corner (in this case 2”). Make sure you make this measurement from the first ¼” pressed down hemand not from the raw edge (image 10). Repeat on the other side of the corner (image 11). 11. On the wrong side of your fabric, draw a line between these two marked points. 12. Fold the corner right sides together and stitch along this marked line, back stitching at ends. Trim seam to ¼”. Repeat on all 4 corners. This will create mitered corners for your hem. Turn right side out and press lightly. 13. Using the 100 wt InvisaFil, stitch hem down. 14. Cut a half moon shape out of a scrap of fabric for the body of the rooster and a beak and comb shape from another scrap. Use a fusible web paper to fuse these to your place mat in the corner. Use the 8 wt Eleganza to blanket stitch around these shapes. We used a long Bullion knot for the legs, and a daisy stitch for the tail and feet. Your placemat is complete! You could make just one for a centerpiece, or one for each place setting at your Easter table. WonderFil™ Specialty Threads carries 25 lines of threads. Have you ever looked at WonderFil™ threads and thought, “Some of them have same weight(wt) and material, what are the differences between them, and which one should I use?” A very frequent question people ask is about the 40wt polyester threads. WonderFil™ carries 4 lines of polyester threads that are 40wt. Even though they may sound the same, their characteristics and uses are all different. This post will provide answers to your questions so whenever you are trying to choose the right polyester thread for your project, there is no need for hesitation!